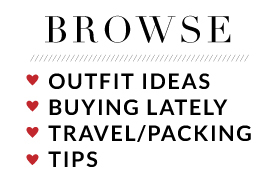 Did you guys shop the Shopbop sale last week? I had a couple of certificates that I've been saving up just for the sale. I had a couple of pairs of shoes and a bag picked out but then I saw this jacket and I was hooked! I've been wanting a suede, taupe colored moto jacket and I loved that this one had a cropped fit to it. I don't like for my moto jackets to look sloppy when worn unzipped, so the fit of this one was perfect! I was able to snag it for only $70 after the sale discount and my certificates. 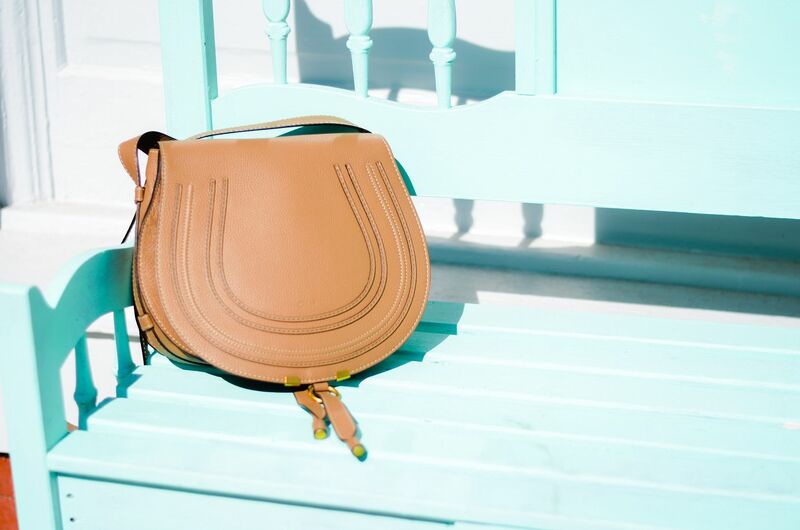 It's quite a splurge at full price, so can I interest you in this LC Lauren Conrad version? Because it's really good! The wine color might have to come home with me! 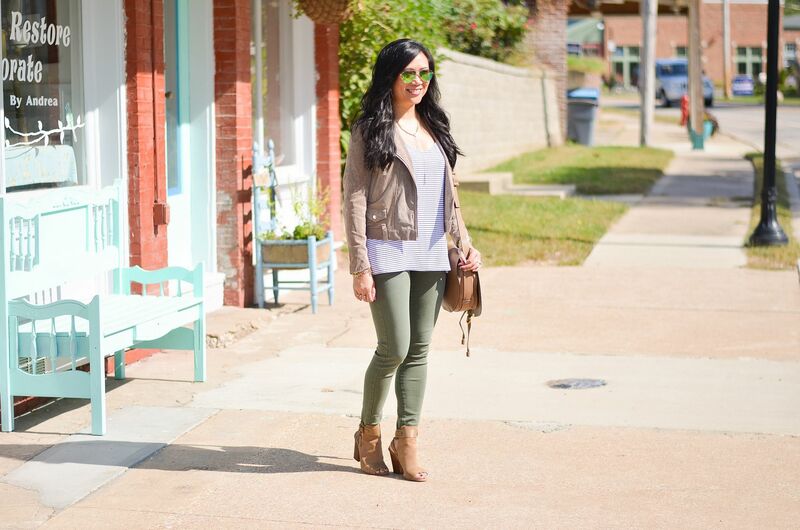 I decided to pair it with other neutrals - easy olive skinnies (that go with ALLTHETHINGS by the way), a striped cami, and taupe colored booties and bag. I loved how this came together. 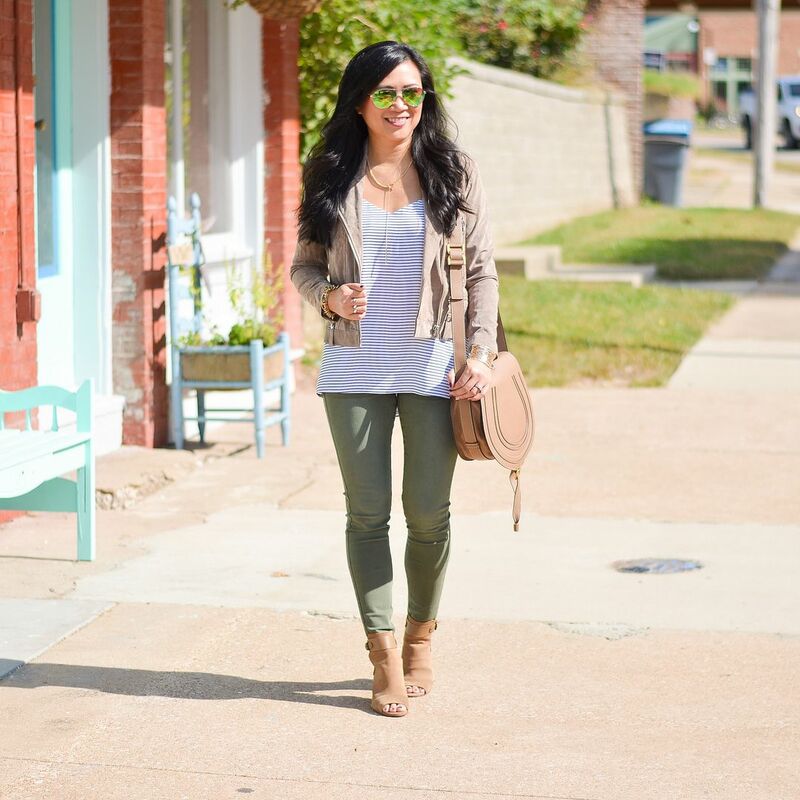 It's always refreshing to wear neutrals once in awhile! It's like a juice cleanse! Not much else to report this week! Yesterday we took our Petie (rat terrier) back to the surgeon for another follow up. Of the four masses, only one of them was potentially a hazard to him so he's been on chemo pills for the last 3 weeks. I was worried how he would react to them, but they don't seem to be fazing him at all, which is good! Hopefully this means the worst is behind us and we can continue to give him a happy pup life! 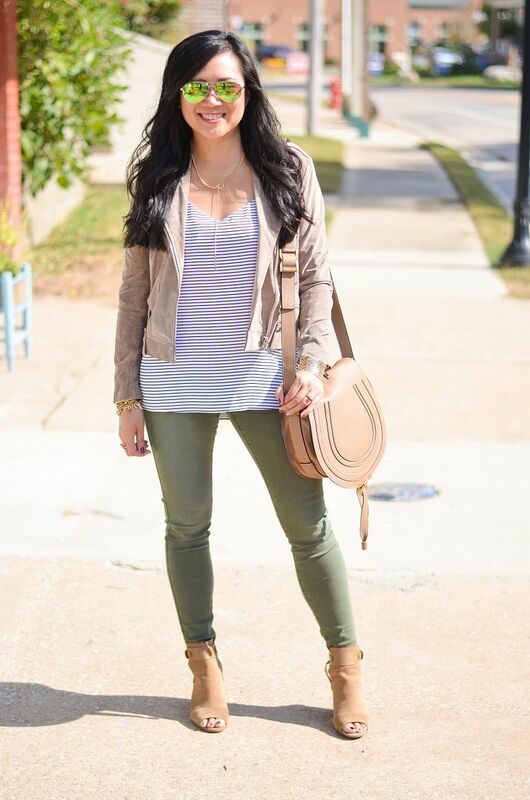 The perfect fall outfit...really love your jacket and that gorgeous bag! So love this look and you know I am obsessed with this bag in that size. So happy to see it featured. Suede just drives me crazy! Oh I LOVE that jacket! And the LC option looks really nice too! I have to lay off purchasing any more jackets until the weather cools a bit more but def adding the budget option to my wishlist! That jacket is fabulous! Love the lower priced LC option too! 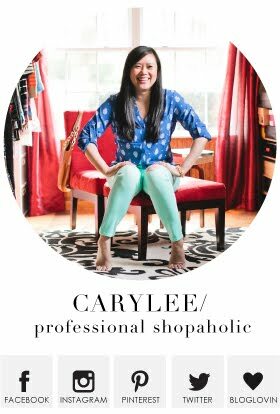 I've been wanting some peep toe booties and I think yours are exactly what I've been looking for! Lovely mix of all the pieces..